i. Political Developments. Iraq has had two political transitions over the past year, taking steps toward a constitutionally-elected government. Nevertheless, the country faces a violent insurgency that is impeding reconstruction and economic recovery. Immediate challenges are to restore rule of law, establish political legitimacy, and begin to build credible and inclusive institutions. The ability of the Iraqi Transitional Government to include ethnic and religious groups in the political process over the coming months will be important in determining whether a future constitutionally-elected government will improve security and stability, which are preconditions for successful reconstruction. ii. Economic Developments. After hitting a low in the wake of the 2003 invasion, real GDP rose by about 47 percent in 2004, reflecting strong oil prices and partial recovery of the oil sector. Income per capita—about US$940—is still only a quarter of what Iraqis enjoyed twenty-five years ago. Although data remain unreliable, surveys suggest that poverty has worsened in recent years; and unemployment is estimated to be at least 30 percent. The government continues to provide large untargeted subsidies for food, fuel, and utilities, amounting in total to about 50 percent of GDP. Although the subsidies provide important support for the poor and vulnerable, they distort markets, disproportionately benefit the wealthy, encourage black markets and smuggling, and burden the budget, crowding out potentially more efficient spending on targeted social programs. iii. Economic Prospects. Real GDP growth is projected at about 3.7 percent in 2005 due to stagnating oil production and exports. Growth is expected to accelerate to 17 percent in 2006, predicated on increased security and political stability, higher oil production and exports, and continued strong world oil prices. Strong growth also depends on introducingtargeted safety nets and implementing structural reform —including a gradual reduction in subsidies—to contain recurrent spending and allow for sufficient investment and reconstruction. Iraq’s overriding challenge—for both stability and economic sustainability— is to improve the management and transparency of oil revenues. iv. The Government’s Strategy and the International Response. Iraq’s National Development Strategy (NDS), which emphasizes good governance, private sector-led growth, and strong social safety nets, provides a framework for donor assistance. Although donors pledged US$32 billion at the International Conference for Iraq in Madrid in October 2003, continued lack of security has complicated delivery of donor assistance and lessened its impact on the ground. Donors have deposited about US$1 billion in the International Reconstruction Fund Facility for Iraq (IRFFI), which consists of two trust funds, one administered by the World Bank and another by the United Nations. Nearly all donor deposits to IRFFI have been allocated to projects that are ongoing. Most aid to Iraq takes the form of bilateral assistance, mainly from the United States. Japan is the second largest donor. v. Progress under the World Bank’s First Interim Strategy. 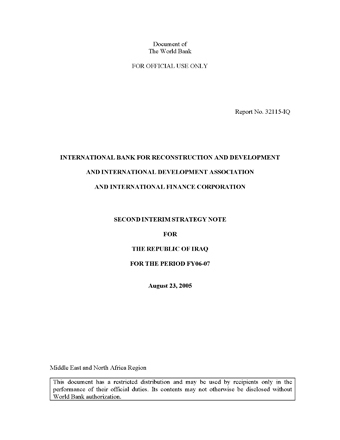 The First Interim Strategy, discussed by the Executive Directors in January 2004 and originally intended to cover nine months, was designed to rely on the World Bank Iraq Trust Fund (ITF) within the IRFFI to finance projects. Between March and December 2004, the Bank approved and launched nine emergency projects amounting in total to US$366 million. A first capacity building project is completed, an emergency textbook project is nearly completed, and seven additional operations are under implementation, addressing capacity building, healthcare, private sector development, rural infrastructure, school construction, urban upgrading, and water supply and sanitation. The ITF portfolio balances immediate needs and near-term employment with medium-term interventions to improve service delivery. The Bank, using its own budget, is also helping to lay the groundwork for Iraq’s medium-term program through analytical and advisory activities (AAA). vi. Objectives. The Bank’s overarching objective is to help Iraq build efficient, inclusive, transparent, and accountable institutions as needed for stability, good governance, and sustainable economic prosperity. Better institutional frameworks, policies, and systems will improve the efficiency and effectiveness of both national expenditures and international aid. Under the umbrella of institution building, the Bank Group’s work program is organized into four pillars, supporting government efforts to: (1) restore basic service delivery; (2) enable private sector development; (3) strengthen social safety nets; and (4) improve public sector governance. Investment projects fall under Pillar 1: Restore Basic Services. Pillars 2, 3, and 4 are mainly supported by AAA.